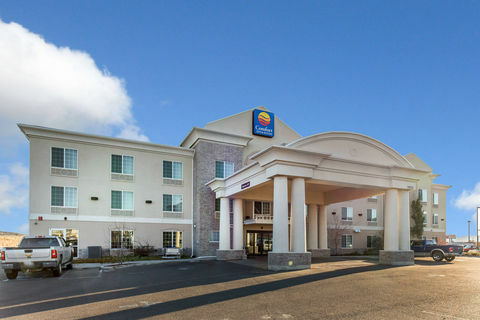 The Comfort Inn & Suites® hotel provides convenient access to many local points of interest. Popular attractions like Flaming Gorge National Recreation Area and Rock Springs Historical Museum are easily accessible from this Rock Springs, WY hotel. Expedition Island park, a National Historic Landmark, is nestled along the banks of the Green River, and provides the perfect backdrop for outdoor recreation activities like hiking, biking and fishing. White Mountain Mall is less than a mile away and offers a variety of retailers and eateries. Several entertainment venues, restaurants and cocktail lounges can be found in the surrounding area. Your Morning Breakfast is full of hot and delicious options, making breakfast at Comfort Inn & Suites the perfect way to start your day. Enjoy our free hot breakfast featuring eggs, meat, yogurt and fresh fruit, cereal and more, including your choice of hot waffle flavors! After a busy day of meetings or an exciting day of sightseeing, guests of this Rock Springs, WY hotel are invited to relax by the indoor heated pool and indoor hot tub. The on-site business center provides guests with access to conveniences like copy and fax services.